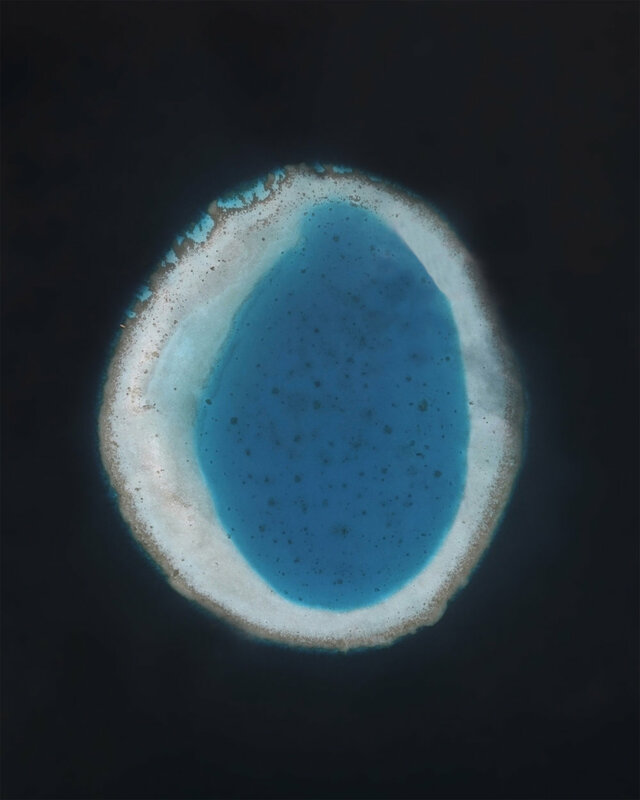 The satellite images in the Typologies series depict coral reefs and islands in the Republic of Maldives. Rather than document the obsolescing instruments of fossil fuel production, we employ Bernd and Hilla Becher’s rigid formalism to make visible the subjects of the industry’s disastrous impacts. The seductive beauty of the atoll formations belies their vulnerable position at an average of 4 ft (1.2m) above sea level. Warming seas threaten to destroy the reefs, which support more species than any other marine environment, and the Maldivian government has already begun evacuating island populations to mitigate the risks of sea level rise, which at current rates, could render the islands uninhabitable in the next 50 to 100 years. The islands depicted in Typologies I (Islands) are located in the Thiladhunmathi Dhekunuburi atoll and are part of the Haa Dhaalu administrative division. Recent census data shows that the islands of Kunburudhoo and Maavaidhoo are no longer inhabited; populations have relocated to Nolhivaramu.